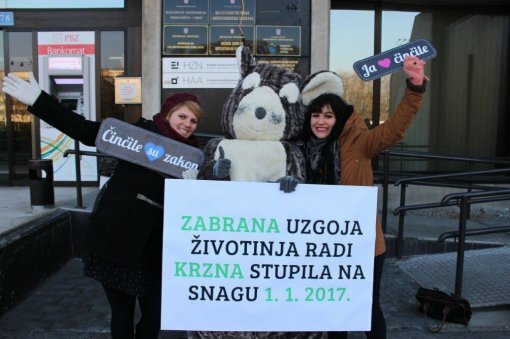 The long-awaited ban on fur farming in Croatia came into force on January 1, 2017, after a ten-year-long phase-out period. 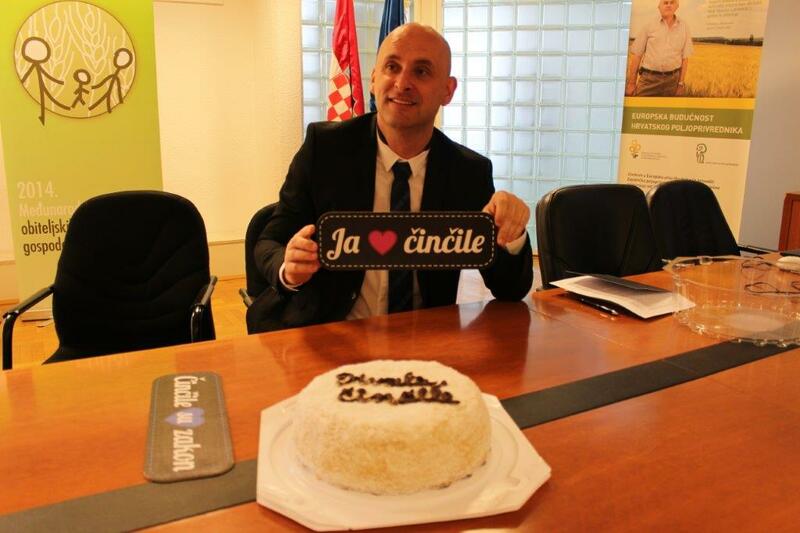 Many in Croatia and abroad welcomed the news with great joy and pride. 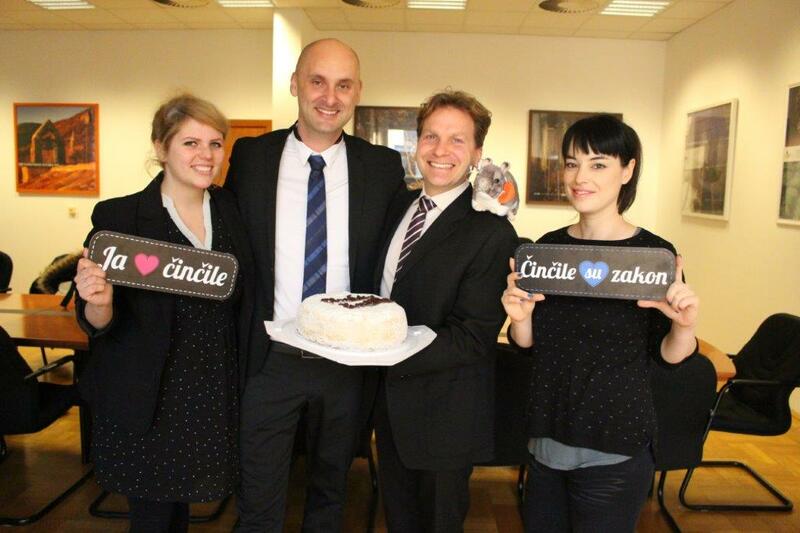 Animal Friends Croatia, which is a member of the forty-strong international Fur Free Alliance, brought a vegan cake to the Ministry of Agriculture to thank the Ministry for supporting the Animal Protection Act and animals. On Wednesday, January 11, 2017, Minister Tomislav Tolusic received Chinchi and the organization's representatives on the Ministry's behalf. "Croatian farmers had a phase-out period of 10 years to shift their production―the deadline has expired and the public laid out its reasons against extending the deadline. Animal Friends greatly contributed to this process. I take this opportunity to thank everyone who has participated and contributed in drafting the Animal Protection Act, which will soon go into the adoption procedure and will bring a number of new provisions to offer a greater protection to animals," said Minister Tolusic after the meeting. The news about the ban was widely reported and quickly spread even outside Croatia, proving that we can serve as a great positive example. We've been receiving supportive and congratulatory comments from all over, which goes to show that the public highly appreciates good decisions. Since there are a few remaining chinchilla farmers who haven't stopped producing in time, Animal Friends offered in December to help find homes for the remaining animals. The turnout of people willing to help chinchilla has been enormous. Surveys conducted in many European countries have long been showing a growing trend in opposition to exploiting animals for fur, with people deeming it unnecessary and cruel. In response, many more countries are considering adopting laws to protect the animals. Fur farming bans are already in place in the United Kingdom, Austria, Slovenia, Macedonia, Bosnia and Herzegovina, Serbia, and the Belgian regions of Wallonia and Brussels. In the Netherlands, the ban has recently been successfully defended in the Supreme Court as the ultimate competent institution. Other countries such as Denmark, Germany, Sweden, and Switzerland have bans on certain animals or other legal restrictions that hinder farming. Discussions on imposing a total ban have been started in the Czech Republic, Estonia, Norway, and Flanders, the only remaining Belgian region without a ban. Animal Friends would like to thank everyone who helped achieve this victory for animals and Croatian legislation. We believe that this is the beginning of good news for animal protection.